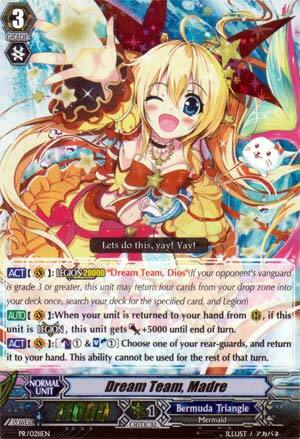 [ACT](VC):Legion20000 "Dream Team, Dios" (If your opponent's vanguard is grade 3 or greater, this unit may return four cards from your drop zone into your deck once, search your deck for the specified card, and Legion) [AUTO](VC):When your unit is returned to your hand from (RC), if this unit is Legion, this unit gets [Power]+5000 until end of turn. [ACT](VC):[Counter Blast (1) & Soul Blast (1)] Choose one of your rear-guards, and return it to your hand. This ability cannot be used for the rest of that turn. Oh, finally, something a bit more meaty. This girl performs Legion with Dream Team Dios, and once in Legion, every time you bounce your rear-guard, she gains 5k power until end of turn. If you can't bounce with other skills, she comes with her own, for CB1 and SB1. I don't really care for it. I don't really want to pay a cost to bounce anything, not CB especially since you then need to combine this with something else to make it even remotely worthwhile. Only target to bounce I can think of belongs to Duos, but if that's the deck you want you'd run Duo's Legion, not Madre because user friendliness. Can't expect much from a generic Legion. Dios also isn't worth running in today's meta either.